Dubai is a city with a diverse and vibrant culture. With an economy historically built on the oil industry, Dubai’s main revenues come from tourism, trade, avaiation, real estate and financial services. Not only does Dubai have the infrastructure, services and people to support commercial success, it is universally recognised as offering one of the most business-friendly environments in the world. It is also the region’s transport and logistics hub, a key factor in the decision of multinational companies to establish themselves in the emirate. Dubai is one of seven emirates in the United Arab Emirates (UAE). In terms of setting up corporate entities, Dubai’s multi-jurisdictional nature offers a multiplicity of options. Dubai has built a position as a major commercial, industrial and trading hub in the region, and in order to maintain that position, particular attention has been paid to easing the process of setting up companies. Depending on business objectives and the preferred shareholding structure, foreign investors have the option of setting up either in mainland Dubai, or in one of numerous industry-specific free zones. Dubai’s Department of Economic Development (DED) is the department in charge of licensing and registration of corporate entities in mainland Dubai. The DED’s licensing and registration procedure is streamlined to offer ease of registration based on specific business activities of the corporate entity. The Commercial Companies Law (CCL) is the federal law that regulates all entities set up in the UAE mainland, and governs corporate entities set up in mainland Dubai. In the UAE mainland, the main limitation in setting up a limited liability company (LLC) for foreign investors is the foreign ownership restrictions. When setting up a LLC, the CCL prescribes that at least 51% of shares must be registered under a UAE national (natural or legal person). In practice, there are professional service providers (PSPs) acting as nominee shareholders, holding the 51% of shares for, and on behalf of, the foreign investor. Commonly, where such PSPs are used and the foreign investor is vested with 100% beneficial interest in the LLC, the LLC’s memorandum of association will typically be drafted in such a way as to confer all authorities and powers to operate and manage the LLC on the foreign investor, including for example the appointment powers of the board of directors, the general manager and other officers. Another safeguard that can be provided to the foreign investor is contractual. Frequently, the foreign investor and the PSP enter into contracts generally referred to as side agreements, which facilitate a contractual relationship between the parties that safeguards the foreign investor to the maximum extent possible by law. A major advantage of having an LLC in mainland Dubai is that within mainland Dubai there are no territorial restrictions on the business activity or on the premises of the office, and there is no minimum capital requirement. It is important to note that there is a tax regime in place, but it is not in effect, and that there is a 5% customs duty on all imports. Setting up a branch of a foreign company in mainland Dubai is another option available. A branch does not have an independent legal personality, being in the legal sense an extension of its parent company. A branch can undertake all activities of its parent with the exception of trading in the UAE mainland. When setting up a branch, one needs to appoint what is known as a local service agent (LSA), which has to be a UAE national (natural or legal person). Unlike the foreign ownership restriction for LLCs, the LSA requirement is purely procedural. The LSA has no role, interest or right in the business, or the assets of the branch. Typically, the LSA’s role is to liaise with government offices to open the labour and immigration files for branch employees’ visas. Normally, the LSA is paid an annual fee for providing such services. Free zones act as a one-stop shop to facilitate the establishment of corporate entities and aiming to satisfy all their needs, from licensing and registration to labour and immigration, providing a business-friendly environment as well as access to required services. 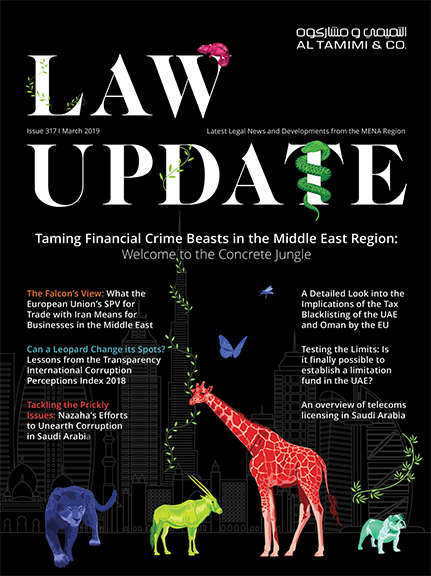 Across the UAE there are designated territorial areas that are considered distinct legal jurisdictions from the UAE government, allowing free zone jurisdictions to regulate, license and register corporate entities independently. Dubai boasts more than 30 free zone jurisdictions. The key advantage to foreign investors is that free zones generally offer the option of 100% foreign ownership of entities without the need of a UAE national acting as an agent or otherwise. Additionally, free zone laws generally prescribe a guaranteed tax-free period of 50 years, customs duties do not apply where the imported goods are for the use of the company, and there are no restrictions on repatriation of capital and profits. The main restriction for a free zone entity is that it cannot conduct trading activity outside of the territorial limits of the free zone without appointing a Dubai mainland based commercial agent, and upon entry of goods into mainland Dubai, a customs duty will be applied. Select free zones, for example Jebel Ali Free Zone (JAFZ), offer the option of setting up offshore companies. Offshore companies are not regarded as operational entities, acting merely as holding companies. JAFZ offshore companies can only own property in designated areas in the UAE. A key advantage of offshore companies is that they are quick to set up, there are no limitations on foreign ownership and there is no minimum share capital requirement. A key limitation of offshore companies is that they cannot sponsor any employees. First published in China Business Law Journal March 2015.